Providing funding for transporting up to 2000 horses to non-profit sanctuaries and Native American reservations. Establishing the Save the Mustangs fund for public contributions. Donations will be managed by Take Pride in America, and are tax deductible. Take Pride in America works toward preserving public lands, historical sites, and places and things that reflect American spirit. It has a Wild Horse and Burro Sponsorship Program. The symbol of the Ford fund, as you can guess, will be the familiar Mustang Sport Car insignia, this time with a ribbon around its neck. Ziad Ojakli, group vice president of Corporate Affairs for Ford Motor Company and Kathleen Clarke, director of the U.S. Bureau of Land Management (BLM) announced Ford Motor Company’s “Save the Mustangs” project at a wild horse sanctuary in South Dakota. Ford established this program in collaboration with the BLM and the Take Pride in America to help maintain thousands of wild mustangs. Ford Motor Company delivered the first group of wild mustangs to the Black Hills Wild Horse Sanctuary last week, that will forever live in freedom. Part of a larger commitment from Ford, their efforts hope to save thousands of wild horses that currently face an uncertain future. Working with the U.S. Bureau of Land Management and Take Pride in America, Ford has created the “Save the Mustangs” fund to help maintain thousands of wild mustangs. Actress and animal advocate, Stefanie Powers, joined Ford Motor Company to announce the “Save the Mustangs” project. Ford worked with the U.S. Bureau of Land Management and the Take Pride in America to establish a program to help maintain thousands of wild mustangs of the West. Ford to provide funding to preserve thousands of wild mustangs. U.S. Bureau of Land Management is resuming sales of wild horses and burros. HOT SPRINGS, S.D., May 19, 2005 Ford Motor Company announced today that it will provide aid to help save about 2,000 wild mustangs that currently face an uncertain future. In addition, the company is offering a means for the public to help “Save the Mustangs” working with the United States Bureau of Land Management (BLM) and Take Pride in America to establish a fund to serve as a means for the public to contribute financial support to help maintain the wild horses. The unique initiative brings together the government, Ford Motor Company and the public to help save the wild horses. “This new partnership is an example of how the public sector and private industry can work together to help provide for long-term care of these animals, while sustaining the health and productivity of America’s public lands,” said U.S. Interior Secretary Gale Norton. The BLM is resuming its sales of wild horses and burros affected by a new Federal law after revising its bill of sale and pre-sale negotiation procedures to strengthen the agencyâ€™s efforts in finding good homes for the animals that must be sold, said BLM Director Kathleen Clarke. In addition, Clarke said the Bureau is working to persuade all three U.S. horse processing plants to refuse to buy any BLM freeze-branded horses sold under the new law. Today’s action ends the BLM’s temporary suspension of sales, which took effect April 25 in response to two incidents involving the commercial processing of horses that had been re-sold or traded after being bought from the BLM. To help provide a means for the public to contribute to the ongoing care of wild mustangs in their new habitats, Ford has established the Save the Mustangs fund. Wild horse lovers can learn more about the issue and can help support the cause by visiting www.savethemustangs.org. Contributions to the Save the Mustangs fund will be managed by Take Pride in America and are tax-deductible. After learning that thousands of wild mustangs were in jeopardy, Ford Motor Company approached the BLM to explore potential ways to provide support for the animal that has served as an inspiration for the company for decades. While working with BLM on a broader plan to provide safeguards for the wild mustangsâ€™ continued protection, Ford interceded at the agencyâ€™s urgent request on April 25 to prevent the slaughter of dozens of wild mustangs. The horses were no longer in the control of the BLM as they had been re-sold and sent to a processing facility for slaughter. Ford purchased the 52 horses and donated them to the Black Hills Wild Horse Sanctuary outside Hot Springs, S.D. The initiatives announced today will help ensure that larger numbers of wild mustangs are relocated to good homes, primarily at non-profit sanctuaries and Native American reservations. Nearly 32,000 wild horses and burros roam public lands managed by the Bureau of Land Management in 10 Western states. These wild animals have virtually no natural predators, and their herd sizes can double about every five years. To maintain populations in balance with their habitat, the BLM removes excess animals from the rangelands every year. The BLM places thousands of wild horses and burros into private ownership through adoption each year. Approximately 22,500 Mustangs that have been removed from the rangelands are currently in federal holding facilities. The BLM was directed to sell more than 8,000 wild mustangs as a result of a bill passed by Congress in December 2004. This legislation requires the BLM to sell gathered wild horses and burros that are more than 10 years old or have been offered unsuccessfully for adoption at least three times. The wild mustang, the symbol of the legendary Ford Mustang sports car, has had a unique place in Ford Motor Company lore. Although the original Mustang concept car was named for the American P-51 Mustang fighter plane, the production Ford Mustang was introduced with great fanfare in April 1964 proudly wearing the wild horse insignia. “The Ford Mustang is America’s iconic sports car and takes its inspiration from the wild mustang, a true icon of American freedom,” said Bill Ford. The Save the Mustangs fund will feature a new but familiar symbol â€“ the Ford Mustangâ€™s wild horse insignia with a ribbon draped around its neck. The U.S. Department of the Interiorâ€™s Bureau of Land Management (BLM)manages 261 million acres of land â€“more than any other Federal agency.Most of this public land is located in 12 Western States, including Alaska. The Bureau, with a budget of about $1.8 billion, also administers 700 million acres of sub-surface minerals throughout the nation. The BLM’s multiple-use mission, as set forth by Congress in Federal law, is to sustain the health and productivity of the public lands for the use and enjoyment of present and future generations. The Bureau accomplishes this by managing such activities as outdoor recreation, livestock grazing, mineral development, and energy production, and by conserving natural, historical, and cultural resources on the public lands. Take Pride In America was created in 1985 to preserve and maintain American public lands and historical sites and has evolved to protect places and things that symbolize the American spirit. Through its Wild Horse and Burro Sponsorship Program, which offers a variety of sponsorship levels to assist wild horses that have been placed in holding facilities, Take Pride In America is heavily involved in the effort to preserve wild, free-roaming mustangs and burros. Ford Motor Company, a global automotive industry leader based in Dearborn, Mich., manufactures and distributes automobiles in 200 markets across six continents. With more than 325,000 employees and 110 plants worldwide, the company’s core and affiliated automotive brands include Aston Martin, Ford, Jaguar, Land Rover, Lincoln, Mazda, Mercury and Volvo. Its automotive-related services include Ford Motor Credit Company and Hertz. For more information regarding Ford’s products, please visit www.fordvehicles.com. The 65th Running of the Iroquois Steeplechase was on Saturday, May 13, at Percy Warner Park in Nashville, Tennessee. I’ve attended since 2001. 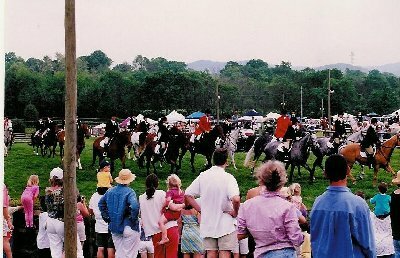 Unlike racing’s reputation for events meant only for wealthy horse owners, the Iroquois is very much a family event, with affordable tickets and children under 12 admitted free. Indeed, the Iroquois helps children and their families in a big way, since it benefits Monroe Carell, Jr. Children’s Hospital at Vanderbilt. Everyone is encouraged to bring their picnic baskets, drinks (in plastic receptacles only, please), umbrellas, blankets and chairs. You should also bring your camera for truly magnificent shots of the horses leaping over the jumps and your binoculars if you want to see everything up close. And important: don’t forget hats and sun block. I’ve attended the steeplechase in all kinds of weather, through heat and cold, wind and no wind, rain and no rain, and I’ve loved every minute of it. The excitement starts right away, with the anticipation of the crowd that boards the shuttle busses to the site, laden down with all their paraphernalia. 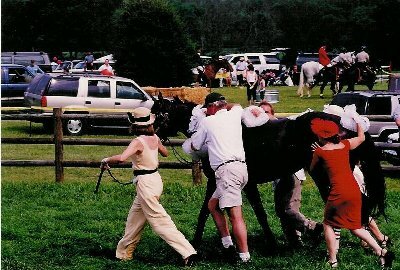 Then when you finally get yourself organized, put on your sun hat, and relax with a cold drink, the first race is announced, and you run to the rail to see those marvelous horses lift themselves up and over the jump, land on the ground, and immediately start running again as fast as they can to the finish line. There’s just nothing like it. 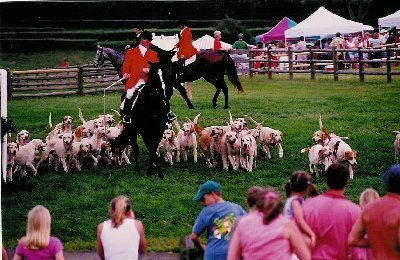 The history of the steeplechase starts in 1752, says the National Steeplechase Association, when two Irish foxhunters held a race from one church to another in Doneraile County, Ireland. 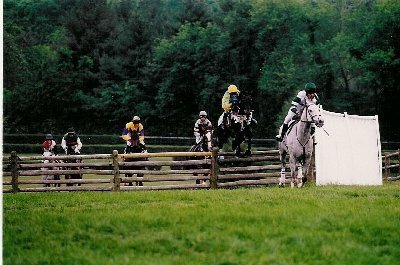 Thus the word “steeplechase” comes from a race in which riders set a church steeple as the goal. The first steeplechase race in the United States was held by the Washington Jockey Club in Washington, D.C. in 1834. 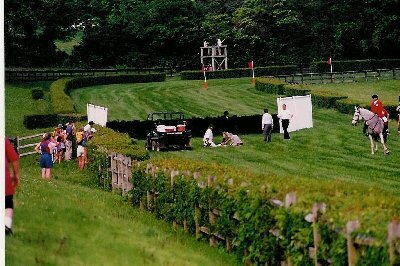 Today, the National Steeplechase Association lists 39 events in 12 states. The Iroquois course was built in 1938. The first race in 1941 was named after Iroquois, the first American-bred horse to win the English Derby. The steeplechase has been run ever since, with one suspension in 1945 because of the war. 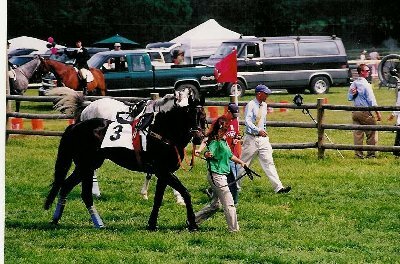 The Iroquois website lists these interesting facts about steeplechase horses and jockeys: the average weight of a ‘chase horse is 11 pounds, while is jockey is about 145 pounds. The thoroughbred will be over 16 hands and must leap a hurdle of 54 inches. The approximate length of that leap is 20 feet. Race courses are from 2 to 4 miles long. There are about 12 jumps along the way. 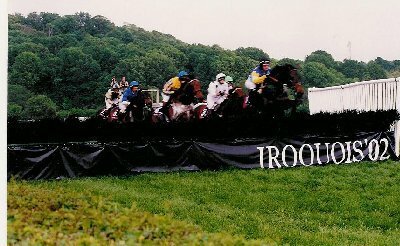 The three-mile Iroquois course is long and grueling, and puts a lot of strain on both horses and riders. 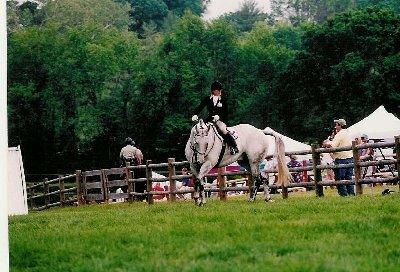 When you watch the fiercely competitive riders who are vying for generous purses and the trophy for the winner, you realize that you’re seeing the finest riders, honed by their experience in races held all over the eastern half of the country, and horses trained by the most experienced and skilled trainers in the sport. Iroquois Day is an occasion not to be missed. Here are some of my favorite pictures showing the color, drama, excitement and fun of the Iroquois. All copyright by Jeff Fisher. 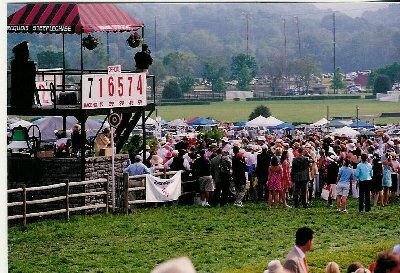 For more on the Iroquois Steeplechase, go to www.iroquoissteeplechase.org. 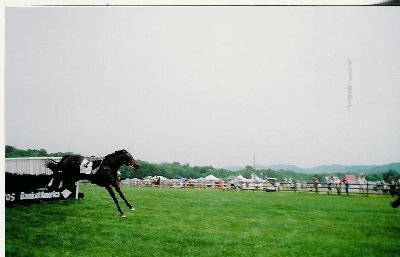 And for more information on the sport of steeplechasing in the United States, go to www.nationalsteeplechase.com.